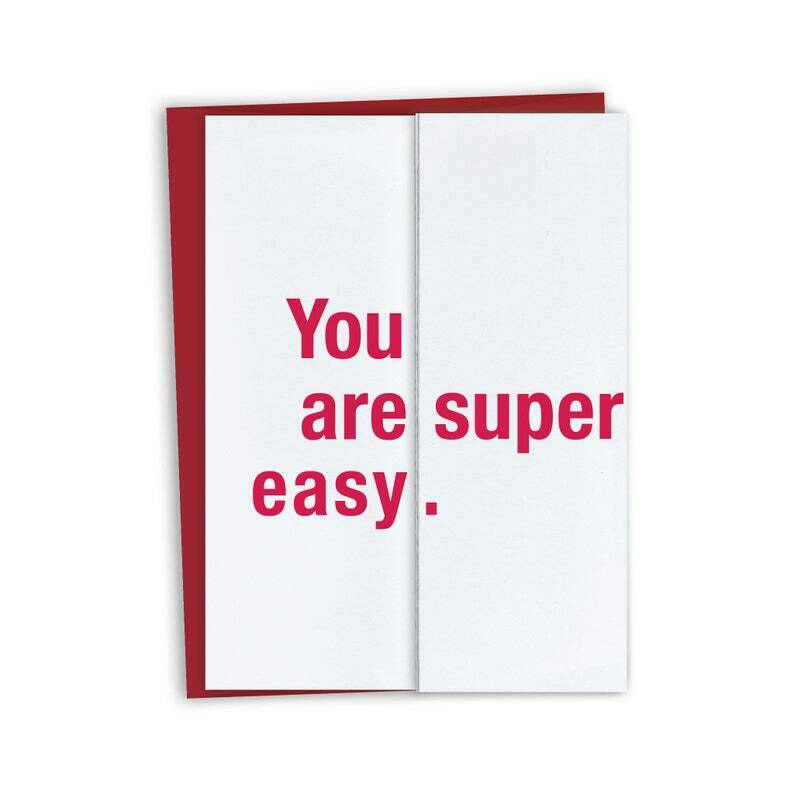 This card is super easy to give. Folded: You are super easy. Unfolded: You are so lovely and sweet. It's super easy to love and respect you. • A6 size: Folded: 4.5 x 6.25", Unfolded: 13.5 x 6.25"
Visit FINCHandHARE.com for complete product line. © 2012 Heather Abbott. All rights reserved. • We accept payment via PayPal and credit card. • Orders must be paid in full before we begin or ship your order. • Contact us immediately, within 5 days of delivery. • We will work to get your order corrected or refunded right away. • For stock items, we’ll send instructions on how to return your items. • Let us know right away. If the order has not been sent out or not yet been picked up by the post office, we can change to your new/corrected address. • If the order has already been sent out, we cannot stop the shipment. • If you would still like the items, but you don't believe they will be forwarded to your new address, you will need to repurchase. • If the original order is returned to me by the post office, the items will be refunded, minus shipping prices (if your order applied for free shipping, shipping costs will subtracted from your refunded amount). • Let us know right away. You (the buyer) will be responsible for shipping prices to and from our location. Returned orders that qualified for free shipping will have a $5 return fee subtracted from their refund. All returned items must be in new condition, and no refunds on custom items/orders. • Orders ship with standard USPS shipping, but there are upgrades available at checkout. • Vary depending on local post office efficiency, weather conditions, holiday seasons, etc..
• Delivery timelines below are estimates only, and do not include our processing time. • Unless marked "guaranteed," refunds are not given for items received outside of time range. *Tracking not included in standard shipping of 1-3 greeting cards, and most international orders with standard shipping. For those orders, the option to upgrade and add tracking has same timeframe for shipping. • Many countries charge Value-Added Tax (VAT) or Customs Fees on purchases from the U.S.
• These are not shipping charges, they are taxes. • Buyers are responsible to pay these taxes/fees within their own country. • Merchants are not able or allowed to charge or collect for these fees. • Please investigate these fees before ordering. Do fold-out cards require extra postage? Nope! A fold-out card and envelope weigh less than 1 ounce, so they can be shipped with a regular stamp within the U.S.
Can the text or envelope colors be changed? We can switch out color for color. For example, on a card with red and gray text, we can replace one color instead of the red text and/or one color for the gray. For envelopes, we have red, gray or white. We do not offer drafts for color or wording changes. If you decide to order, let us know the details in the notes to seller section at checkout. We will do our best, but we don’t guarantee exact color matches. Pantone numbers or a link to the colors you are trying to match will help us. Let us know the details in the notes to seller section at checkout. Monitors display color differently, so the color you see on screen may be different than the actual color of the printed version. Can you print in metallic ink? We do not offer metallic ink printing. Can I change the wording on a fold-out card? You can add names or a line of text to fold-out cards. On wedding party cards, the last “Will you be my…?” line can be changed to whatever you’d like. These changes can be requested in the notes section at checkout. Requests for changes to the text that creates the fold-out message need to be made prior to purchase. Can I ship directly to the recipient, instead of myself? Can you make me a custom fold-out card? Design fees for custom fold-out cards start at $50 (not including cost of card/s). Contact us for further details and pricing. Available to eligible retail stores. Visit me at FINCHandHARE.com. Tracking on my order hasn’t been updated in a long time. The tracking system can be handy, but unfortunately also very inconsistent. Some places and postal workers don't scan items, so we may not see many entries on your package. For international orders, the last entry we see, outside of being scanned “delivered,” is often when it leaves the U.S. or arrives into Customs. Although the tracking system is somewhat unreliable, packages are very rarely lost, in my experience. If your order hasn’t arrived within 4 weeks, let us know. We may know of a Customs backup in your country or whether other orders are delayed as well.